Doneraile (Dún ar Aill – “fort on the cliff”) (pop. 1500) is an attractive town located on the Awbeg River, in the foothills of the Ballyhoura Mountains and within sight of the Nagle Hills. The name dates back to the early C12th, when a clan called Deagha built several strongholds in the area. A Welsh Norman family called Synan erected no less than five castles locally, while the Roches, self-styled Lords of Fermoy, had two. Their feudal overlords were the mighty FitzGeralds of Desmond. Doneraile Castle, founded in 1172 as the seat of the long powerful Synan dynasty, was acquired in 1636 by Sir William St Leger, Lord President of Munster. He was confirmed in his possession by the 1639 grant of the Black Letter Patent of Doneraile. The castle survived an insurgent attack during the 1641 Rebellion, but was burned by the forces of the Kilkenny Confederacy under Lord Castlehaven in 1645. Doneralie Court was (re)built in 1725 to a design by Isaac Rothery by Arthur St. Leger, 1st Viscount Doneraile and Baron Kilmeadon. His daughter Elizabeth St. Leger was notoriously discovered eavesdropping on a Masonic Lodge meeting being held in the library and made to take the Masonic vows, thus becoming one of only three female Freemasons in history. She married Sir Richard Aldworth of Newmarket. Her son St Leger Aldworth inherited the St Leger estates and assumed the surname in lieu of his patronymic; as St Leger St Leger he notably represented Doneraile in the Irish Parliament from 1761 to 1776, when he was made Baron Doneraile, and in 1785 he became 1st Viscount Doneraile (2nd Creation). (In 1780 he notoriously horsewhipped Fr Neale, the local Roman Catholic priest, for criticising the adulterous behaviour of his mistress’s brother. Represented by the young barrister John Philpot Curran, the clergyman was awarded 30 Guineas in damages by a Protestant jury. Lord Doneraile challenged Curran to a duel, at which he fired and missed, while the advocate declined to raise his pistol). In 1887 the black-bearded 4th Viscount Doneraile, Hayes St. Leger (b. 1818), a well-known hunting enthusiast, was bitten by a pet fox and contracted rabies; his servants smothered him with pillows to spare him suffering and prevent him spreading the disease to others. In its heyday the estate comprised 28,000 acres, eventually distributed amongst the tenants under the provisions of the various Land Acts. The 7th Lord Doneraile’s widow sold the mansion and 600 acres to the State in 1964. While the Forestry Commission developed the Park, the house remained empty until rescued by the Hon. Desmond Guinness and the Irish Georgian Society, who restored it with voluntary contributions. Since 1994 the mansion and estate have been run by the OPW. Doneraile Wildlife Park is magnificent. The fine portico off the old Turnpike Road opens onto a winding mile-long main avenue to the old mansion. The surrounding parklands and woods shelter herds of red, fallow and Sika deer and mature groves of deciduous trees, including Californian redwoods, Chusan palms, European larch (a 1738 gift from the Duke of Atholl), Spanish chestnut, cork and holm oak, cherry, yew, lime, ash, variegated sycamore and plane. The pleasure grounds near the mansion were laid out in the early C18th in the style inspired by the great English landscape architect, Lancelot ‘Capability’ Brown, with gardens formed by water artificially diverted from the Awbeg River into streams with numerous cascades, spanned by elegant stone bridges, all in such a way as to create the illusion of nature at work. The extensive fish ponds are said to be amongst the largest formal water features in Europe, and fishing is promoted. Wetland areas have been set aside for wild birds, including swans, herons and kingfishers, and are also inhabited by shy otters. Under the St Legers, Doneraile became a thriving town serving the needs of over 20 landed estates in the hinterland, and was sometimes called “a gentleman’s village“. The principal C18th and C19th gentry of the area were the Crones of Byblox House, famous for extravagant parties and Hunt Balls; the Creaghs of Laurentinum House and the Brasier-Creaghs of Creagh Castle, the Stawells of Killbrack House and Old Court, the Norcotts of Park House, the Evanses of Carker House and Newtown Park, the Hills of Graigue House, and the Grove-Whites of Kilbyrne. Although these families have long died out or dispersed, most of their Big Houses still stand. 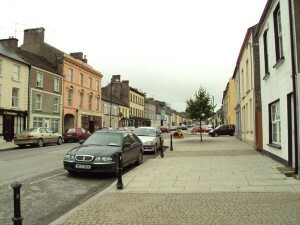 The demise of their way of life led to economic decline for Doneraile, which in the long term at least allowed for the retention of the town’s distinctive Georgian streetscape, now a tourist attraction. Creagh House (1837) on Doneraile’s main street was recalled by author Elizabeth Bowen as the venue for magnificent parties with as many as 200 guests. Sensitively restored, the house now provides top class short-term holiday accommodation for travellers. Carker House & Gardens, part of the former Carkermore estate confiscated from the Roche clan under Cromwell, and principal residence of the Evans family for over two hundred years, can be viewed by the public at certain times by appointment. A popular local story recounts that in March 1823 the Whiteboys attacked the house and found the then Mrs. Evans alone; she told them there was good wine in the cellar, and when ordered to fetch it, stripped off her dress and wriggled out through a small gap in the basement. On her way to seek aid, dressed only in her white undergarments, she encountered the insurgents on the road, who took her for a ghost and fled. Carkerbeg / Carker Lodge was burned down by Whiteboys in 1823. A hand was found amongst the smouldering ruins, leading to the apprehension and conviction of the undergardener Hickey, who had been carrying a blunderbuss that exploded during the raid; he was hanged on the site, attended by Lord Doneraile and many other local gentlemen on horseback. The house was rebuilt and renamed by Captain Charles Croker as Lissa, after an island where he had fought the French. Hermitage House is a handsome early C19th building erected by the Rev John Bagwell-Creagh in Ballyandrew, a townland famed for its medicinal Holy Well (believed to have been a place of Druidic worship long before Saint Patrick blessed it) and for two ghosts, one of a Creagh family dog and the other of a Miss Creagh who died of grief when her father killed her lover. The original dwelling house, now incorporated into the rear courtyard of the Hermitage, was the home of Richard Atkins, killed in a hunting accident in the early C18th; his wife Anne was the only daughter of The O’Sullivan Beare, and they were ancestors of Thomas Davis. Castle Saffron is a reasonably well-preserved Roche Tower House. A large house built beside the ruin c.1750 by the Love family, with decoration by the Lafranchini brothers, was leased by Dr John Creagh in 1788; renamed Creagh Castle, it was destroyed by fire a few years later, and rebuilt in 1816 by Capt. William J Brasier-Creagh. Saffron Hill Cottage, built by the Rev. Edward Sayers in 1708, was home from 1852 to 1861 to Viscount Doneraile’s mother -in-law, Mrs. Lennox-Conyngham, and more recently was a DAWG sanctuary for distressed canines. An interesting article by Kass McGann about the history of saffron in Ireland can be read here. Kilbrack Cottage, said to be the oldest inhabited house in Doneraile, was owned in the 1860s by Edmund Boycott, brother of the infamous Captain Charles Boycott. Byblox House was demolished in the 1960s by a German owner, who replaced it with a rather elegant new residence, now offering B&B accommodation; the old entrance gates and riverside woodland setting add to the ambience. Castle Pook / Castlepook, another C12th Synan family stronghold, is now an atmospheric ruin, recently repurchased by a modern Synon to prevent further deterioration. Two tithe proctors were murdered here in 1832. It now shares its name with a nearby cottage made of recycled materials, including old supermarket fridge doors for windows, the home of Bev Richardson, a Manx “Hedge Witch” sometimes referred to as the Wizard of Doneraile, and his wife and seven children. The family form part of a growing number of people in Ireland who describe themselves as practising Pagans. As a child Bev knew Gerald Gardner, often credited as the modern father of Wicca. The church of the Blessed Virgin Mary (RC) was designed by Michael Augustus Reardon and completed in 1827, on a site donated by Lord Donoraile. Parish priests have included the Very Rev. P Sheehan (who, according to local tradition, was forbidden by Lord Doneraile to have two horses on his carriage and in an act of defiance harnessed two mules instead); Dr Thomas Croke, future Archbishop of Cashel and founding figure of the GAA; and Canon PA Sheehan, the great Irish language writer and tenants’ rights activist, who lived at Bridge House. Tomo’s Bar at the rear entrance to Doneraile Court, known locally as the Lord’s Gate. The Curse of Doneraile is an amusing poem written in 1808 by Galway schoolmaster Pat O’Kelly, who lost his watch locally; upon receiving a replacement from Lady Doneraile, he wrote a Recantation. Both can be read here. The Doneraile Conspiracy is the name of an incident in January 1829 when two gunmen fired on the carriage of Dr. Norcott when he was returning from a party with his daughter, wounding the coachman and footman. Perhaps fueled by Lord Doneraile’s paranoia, the attack was portrayed as part of a Whiteboy plot against three unpopular landlords: Michael Creagh, Vice-Admiral Henry Evans and George Bond Lowe, and the subequent drama-laden trial revealed that Dr. Norcott’s carriage had been fired at by mistake because it closely resembled that of Mr. Creagh’s. The accused were ably defended by Daniel O’Connell, and although some were initially sentenced to be hanged, the sentences were commuted to transportation for life to Australia – also, ironically, the later emigrant destination of the Creagh, Norcott and Stawell families. The Doneraile Hoard was a large quantity of silver coinsfrom the reigns of King James I, Queen Elizabeth, Queen Mary, King Philip II, King Ferdinand and Queen Isabella of Spain, all in mint condition, unearthed by a local ploughman in 1853. Doneraile Cricket Club was founded by Francis Evans and others in 1865, and claims to be the oldest cricket club in Ireland. Horace Plunkett established Ireland’s first successful agricultural co-operative and creamery in Doneraile in 1889. Doneraile is not too far from Castletownroche on ByRoute 3. The church steeples of Buttevant and Doneraile marked the start and finish respectively of a famous 4½-mile cross-country horse race over natural fences held in 1752 between a Mr O’Callaghan and a Mr Edmund Blake, the first recorded account of a steeplechase race. Although cited by many as the first such race in history, modern National Hunt steeplechase races such as the famous Grand Nationals have their roots in late C17th “pounding matches”, held across haphazardly chosen country until the loser fell or was “pounded into the ground” by being out-lasted by the winner. By the mid-C18th chosen courses with a terminatory winning post of a pre-agreed upon landmark, often a church steeple or tower, were more typical than not; apparently “steeplehunt” was the original term. The word “steeplechase” first appears in the draft of conditions for an Irish race held in 1803 “…a sweepstake with added money of a hogshead of claret, a pipe of port and a quarter-cask of rum,” and is next used in the Irish Racing Calendar of 1807 to describe a six mile cross-country match race. Kilcolman Bog, situated approximately 6km north west of Doneraile and 9km northeast of Buttevant, is in fact a rare limestone fen, and is managed as a Wildfowl Refuge. It is County Cork’s only traditional wintering ground for Greenland white fronted geese and it also hosts Whooper Swans, Bewick’s Swans and a variety of dabbling and diving ducks. During the Summer the Fen comes alive with dragonflies, damselflies and other colourful invertebrates. The site is also of great botanical importance, and has been designated as a Specially Protected Area by the National Parks and Wildlife Service. Intending visitors should contact the owner, Margaret Ridgway, in advance (Tel: 022-24200). Kilcolman Castle, northeast of Buttevant, was originally a FitzGerald outpost. It is mainly remembered as the residence of the English soldier poet Edmund Spenser (1552 – 1599), awarded 3000 acres in 1589 for his services in putting down the Second Desmond Rebellion. It was here that Spenser wrote his acclaimed masterpiece, The Faerie Queene (1590), a massive multi-volume epic poem dedicated to Queen Elizabeth I. In it he made several allusions to the beauty of the local landscape, famously referring to the River Awbeg as “the Gentle Mullagh” and “the Mulla fair and bright“. Although he liked the scenery, Spenser disliked the native Irish. The feeling was mutual, and the castle was severely damaged by fire in disturbances during the Nine Years War, obliging the poet to flee in 1598. He died in London the following year, and is buried in Westminster Abbey. His son Silvanius rebuilt the castle, but it was burned again in 1622; he sold the property in 1630 to Sir William St Leger. The romantic ruin stood for several centuries, and part of the Tower House and bawn still survive.